Those looking for a great headphone amplifier have come to the right place. I've reviewed a number of headphone amplifiers for Enjoy the Music.com, with this review of the Linear Tube Audio Micro microZOTL 2.0 headphone amplifier ($1100) being added to my experience. Linear Tube Audio licenses the design technology from David Berning and thus Linear Tube Audio produces this outstanding amplifier. Every one of these OTL (output transformerless) designs has sounded great, but they certainly didn't sound the same. And they certainly didn't all have the same functionality -- far from it. A headphone user must choose a headphone amp that fits his or her needs and tastes, both sonically and functionally. Luckily there is no shortage of choices out there. In fact, the number of choices can be daunting. But, a decision can be made easier by deciding which features are more important, which are less important, or not at all important. As in most things in life, including the Linear Tube Audio microZOTL 2.0 and with only a few notable exceptions, the more one spends on an amp the better the overall sound quality one will obtain. But it is also true that if one spends money on functions one is never going to use the money that is spent on those functions may be best spent elsewhere in ones system. Besides deciding whether one prefers a tube or solid-state headphone amplifier, one must decide whether an onboard DAC is necessary. For those assembling a desktop system an internal DAC is more often than not a mandatory feature. Headphone amps with an internal DAC may come with only one digital input, such as the one USB input that is included on the utilitarian but fine sounding Musical Fidelity M1 HPAP that I reviewed early in 2014. Conversely, there are all-in-one components with not only a DAC, but with preamplifier functions, and a host of other features on board such as the wonderful (and my reference for solid-state headphone amps) Oppo HA-1 which I first used when I reviewed the OPPO PM-1 headphone. Just because I use a solid-state headphone amp doesn't mean that I haven't also fallen in love with quite a few tube headphone amplifiers, one being the gorgeous looking and sounding vacuum-tube powered Woo Audio WA7d Fireflies that I reviewed earlier this year, which also includes a fine internal DAC. And then there is the tour de force portable Chord Hugo that I reviewed at the end of 2014, which is not only battery powered, but has an onboard DAC that is as good as (and better than many) component-sized DACs. Thankfully, there are headphone amplifiers such as the tube powered Linear Tube Audio microZOTL 2.0 reviewed here that has only one function -- as an amplifier. And this tube unit happens to sound great performing this one important task. The manufacturer claims that its fine sound quality is due to the fact that it is free of multi-functioning parts, complex circuitry and ornamentation, and that this unit's output transformer-less circuit is designed so well in the first place. In their literature the microZOTL 2.0 is called a "personal amplifier", because, let's face it; a headphone amplifier is an amplifier. The inclusion of speaker terminals on the rear panel of the microZOTL 2.0 was a smart choice made by its designer. This addition does not take anything away from its sound quality, and adds to its functionality. Audiophiles with a desk-top system should take note of this. But for an audiophile such as myself who depends on a headphone amplifier for daily listening connected to a high-end system that includes a high-quality DAC, the microZOTL is perfect (despite the fact I have little use for the inclusion of speaker jacks on its rear panel). Although I enjoy using an internal DAC when it's available, for the most part I have no need for an onboard DAC in my headphone amp because I'm listening through my main system which uses Auralic's more than competent Vega DAC, which the majority of the time is fed a signal from my music server. I also spent quite a bit of quality headphone time feeding the microZOTL 2.0's RCA inputs with a signal coming from my analog front end using a quite nice sounding Basis/Tri-Planar with Kiseki cartridge and Pass Labs analog set-up. A long run of Cardas from the main system to input 1 on the rear panel of the two input microZOTL 2.0 connects the two. The "2.0" in the moniker of the microZOTL differentiates it from the original microZOTL that was introduced in 2000. But the beginnings of the microZOTL was in 1996, when David Berning introduced his ZOTL design. ZOTL is an acronym for Zero-Hysteresis Output-Transformer-Less amplifier, which attempts to eliminate the problems that were present in other output transformer-less designs. In David Berning's words: "It is not sound quality problems with other OTL designs, but rather the impracticality of having so many tubes in parallel to get the output drive current high enough and to get the output impedance down to something usable. And even so, the output impedance and current drive capability of traditional OTLs only allows it to be used on a select group of speakers". His ZOTL uses radio frequency to change the voltage-current transfer characteristics of the vacuum tube by changing its impedance characteristics, thus enabling it to drive a dynamic loudspeaker. Berning used radio-frequency (RF) "remapping" by using a high-frequency power conversion technique. This high-voltage, low current tube impedance plane is remapped to a high-current speaker impedance through transformers that can operate at a constant RF carrier frequency of 250 kHz. Since the signal is riding on a carrier, Berning claimed that it wasn't susceptible to the distortion that was usually caused by the transformer's "parasitic elements". Unlike a conventional audio-output transformer, this impedance transformation operates on both the AC and DC components of the signal. In the transformer-coupled amplifier, the turns-ratio of the output transformer determines the impedance matching between the output tube(s) and the speaker. In the transformer-coupled amplifier, the turns-ratio of the output transformer determines the impedance matching between the output tube(s) and the speaker. There are practical limits to how large this ratio can be made because of the parasitic elements of the windings, and it is difficult to make an output transformer with more than a 25:1 ratio. With the ZOTL technology the impedance matching is determined by the effective turns-ratio of the RF converter transformers. Without the negative characteristics of the transformer to affect the audio signal, these RF transformers can have much higher effective ratios, and enables one to use various tubes under unusual operating conditions that cannot be implemented with an amp using output transformers. In the microZOTL 2.0, the effective (plate to plate) turns ratio is 168 to 1, making it possible to use a tube for its output that is normally used for input or intermediate gain stages. The 6SN7 tube that is used in the microZOTL 2.0 is respected for its linearity, but the likelihood of making a high-fidelity output transformer for this tube is not as promising. With the high effective turns-ratio used in the microZOTL 2.0, the 6SN7 works well, and a 2 Ohm output impedance is achieved, and without using negative feedback. 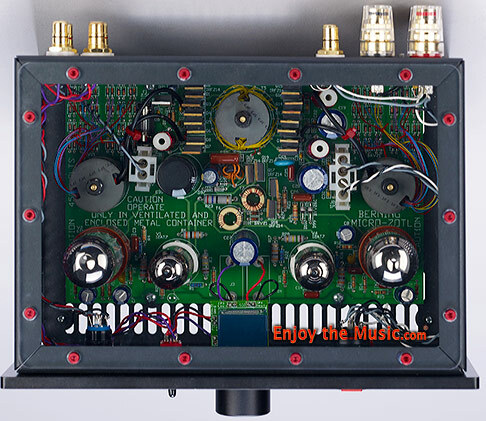 The newly configured microZOTL 2.0 uses a 6SN7 tube, as did its predecessor, and is a push-pull amp design with a Class A output stage that can put out about 1 Watt per channel when used as a stand-alone power amplifier. It uses David Berning's "highly refined" no-feedback Class A triode design which he combines with his ZOTL power supply and impedance conversion circuitry to make this low powered amp. 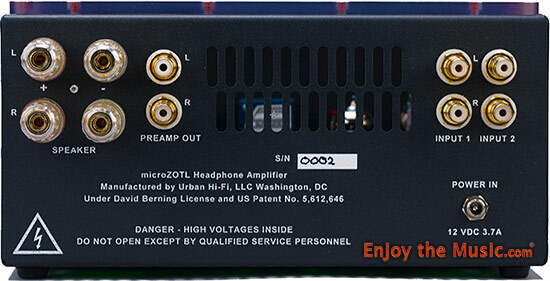 The microZOTL 2.0 comes with a rather large outboard power supply, and one may use the provided power cable or use a power cable of one's choice to connect the power supply to the AC wall outlet. The microZOTL 2.0 is a "personal amplifier" that can drive high-efficiency speakers such as horns and the like, and can also be used as a tweeter amp when bi-wiring a small system. As a bonus, it is also perfect for use as a headphone amplifier � but despite its designer's original intent, its use as a headphone amplifier is obviously its reason for being � at least to me. When browsing through some forums on the internet I've read many audiophiles feel the same, and use the older version of the microZOTL 2.0 as a headphone amp and only a headphone amp. About 15 years ago I began my love affair with headphones. Yes, as most music lovers I've been listening to headphones all my life, but not with high-quality sound in mind. The reason for that was because I didn't own any headphones or headphone amps that could be considered to be any good. Plus, for most of my life there weren't many choices available to me. In fact, there were only a few headphones that were considered "high-end" when I was younger, and the majority of those were out of my league, price-wise. But my headphone listening sessions undoubtedly changed when I purchased a Sennheiser HD-600 headphone in 1999, which I still use today. To power these headphones I acquired a Headroom Little headphone amp with an upgraded power supply, which Headroom sold as the Little More Power headphone amp. I don't quite remember the reason, but I eventually sold this headphone amp, replacing it with a Headroom Micro headphone amp, which on occasion I also still use. Since then quite a few different headphone amps have passed through my listening room, for review and those that I purchased. Currently my reference headphone amp is a solid-state Oppo HA-1, which I acquired at the same time as when I reviewed the OPPO PM-1 headphone. Besides the Oppo PM-1, headphones that I use on a daily basis are the previously mentioned HD-600 which I had rebuilt to its original specifications by Sennheiser USA a few years ago. I also have a set of more than affordable Grado SR80e for more casual listening, but most beloved is my �ber-reference Grado PS1000, which I acquired after reviewing them in October of 2012. I'm well aware that most if not all headphone aficionados have a favorite headphone and headphone amp, and that on more than a few websites dedicated to headphone listening there are "discussions" as to which headphones are the "best". The four headphones that I used for this review vary enough in price and character to present a clear sonic picture of the sound qualities of the microZOTL 2.0, so please, save your letter writing campaign regarding my choice of headphones for issues of greater importance than this. The Berning microZOTL 2.0 is a tube headphone amp with very straight-forward functionality. Its front panel has a small, round on/off switch that glows red when the amp is powered. To the right of the power switch is an input toggle switch which chooses between inputs 1 and 2, and next to that a very smooth running volume control (its smoothness no doubt due to it being an Alps potentiometer). The headphone jack on the far right accepts a standard 0.25" stereo phone plug, which has a red plastic release-lock that secures the headphone's plug. Pressing this release-lock allows the headphone's plug to be removed. A unique physical characteristic of the microZOTL 2.0 is its transparent acrylic top plate. Taking a peek inside the cabinet of a component has never been so easy! When I had visitors to my listening room opinions were mixed regarding this headphone amp's clear cover, as my own feelings are also mixed. More than one guest assumed that my sample of this component was a demo. I suppose this doesn't really matter that much. Yes, it is easier to view the glow of the tubes when the room is darkened, and it is neat to be able to view the inside of the cabinet without removing the cover. But as far as I'm concerned, the sound quality of the microZOTL 2.0 is what matters most. The microZOTL 2.0's sonics impressed me from day one. I listened to many different types of music throughout the audition period, most of it at about the same volume. Finding the volume's sweet spot was easy using the microZOTL 2.0's smooth running volume. It didn't seem to matter that the volume control isn't indented because each time I went to listen to headphones it was usually set at the correct volume. If I switched to another headphone with a different sensitivity level, re-setting the level was no big deal since the microZOTL was able to accommodate any headphone I was using at the time. More importantly, not once did the microZOTL misbehave during my listening tests or when listening for enjoyment. Not a click, pop, hum, or buzz came through my headphones unless it was part of the original program material. In fact, those who know me are aware that I listen to quite a wide variety of music � so one of the first records I spun once I considered the microZOTL 2.0 to be broken in was an album from the mid-1990s that was part of the "glitch" electronic movement, the double album Clicks And Cuts, which includes artists such as Vladislav Delay, Pole, Kid 606, and Panasonic (who are now called Pan Sonic for obvious reasons). This album is part of what was to become a three volume set on the German label Mille Plateaux. So, yes, there were lots of clicks, pops, hums, and buzzes coming from my headphones. But as I will describe many times in this review, at no point did I feel that the microZOTL 2.0 did not reproduce anything other than what the musicians, producers, and engineers intended. After living with the microZOTL 2.0 for a while I replaced it with the solid-state OPPO HA-1 headphone amp/DAC. Although the sound quality of both of these headphone amps is excellent, I was surprised at how different from each other they sounded. This comparison further demonstrated that the microZOTL 2.0's "tube sound" was quite an asset, taking advantage of its vacuum tube innards without much, if any, disadvantages. My praise for the Oppo HA-1 is well known -- it is my reference after all � so I've become accustomed to its transparent, detailed, but not over-analytical sound. In my review of the OPPO PM-1 headphone I described this headphone amp as "killer". But when directly compared to the microZOTL 2.0 the Oppo actually sounded a bit flat and lifeless. After a while I became re-acclimated to the Oppo and its numerous sonic attributes. Yet when I switched back to the microZOTL 2.0 I quickly realized that it was a more immersive experience. This was not because of its transparency, per se, but because each instrument and sound was not only separated from the others in its large soundfield, but I was able to "see" around each instrument, sonically viewing the sides and rear of each sound in space. This wasn't only true with acoustic instruments such as when hearing a violin, where I could picture in my mind's ear the sides and back of the violin, thus being able to discern its relative dimensions in the "soundstage" between and around my ears, but the same was also true for less corporal sounds such as those made by a synth or those coming from a guitar amp. Even though the recently reissued version of the very classic LP Over-Nite Sensation is credited to Frank Zappa, it was originally released in 1973 on Discreet Records with the artist on the record listed as The Mothers (which I suppose is a shortened version of The Mothers Of Invention). Other than using this info as fodder to quiz a music nerd, this great album is certainly one of the most popular, if the most popular Frank Zappa albums in his large catalog. The album features, besides Zappa on his Gibson SG guitar, keyboardist George Duke, the husband and wife team of Ruth and Ian Underwood on marimba/vibraphone and sax, Ralph Humphrey on drums, and Jean-Luc Ponty on violin. This was Frank Zappa's core band during the 1970s, and they put out many choice albums besides Over-Nite Sensation and had many a memorable tour, a few of those shows also released as albums. The first track on side one "Camarillo Brillo" dives right in, and is emblematic of the rest of the record � a sort of jazz/rock/Zappa-esque mixture with risqu� lyrics that border on the obscene. By the time we get to the tune that opens side 2, "Zombie Woof" which features 1960s funk/soul vocalist Ricky Lancelotti, Zappa lets loose with a ripping guitar solo that can compare and compete with the best of his generation. But we're not here to discuss Zappa, we're here to discuss the microZOTL 2.0, which is exactly the point � it is easy to become distracted by the music rather that the equipment that is reproduces it, especially when the sound quality is as excellent as this headphone amp. Sure, there is the fact that the record was being played on a more than average quality analog front-end, but I was also at the time comparing the new pressing of the LP that was overseen by the Zappa Estate (most notably Frank's wife Gail) with the best "original" copies in my collection. This new pressing really is great; it brings out the best in not only the music but the sound of the music. At times I preferred the originals, but this might have more to do with nostalgia than anything else. On Over-Nite Sensation every instrument and voice of this often very complex multi-track recording can not only be heard through the sonic thicket, but can be followed and absorbed. There is a lot going on behind Frank Zappa's upfront vocals, and I could hear the acoustical properties of each instrument's contribution to its sound, that is, whether the track was recorded in the same room as the rest of the band during the basic tracks, or added on later as an overdub. There is also no hiding the fact that this is a relatively early example of multi-track recording, so a good amount of tape hiss can be heard during the (infrequent) quieter sections. But what was also audible was the acoustical environment of each instrument and voice, whether it was acoustically isolated or recorded in a larger space. 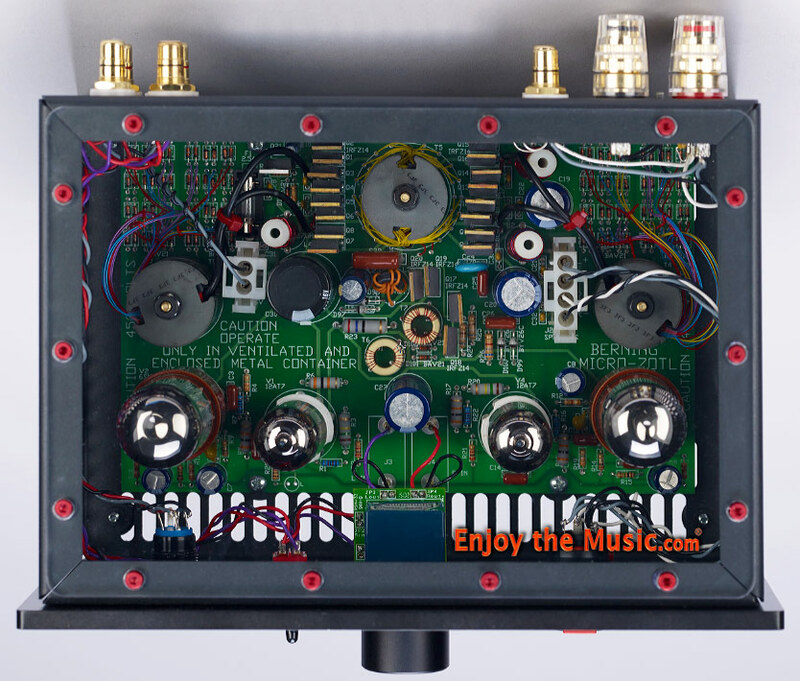 Yes, each instrument sounded extremely lifelike through this headphone amp � but within the limits of the technology of the day. The microZOTL 2.0 bears this out, but at the same time allowed me to enjoy this album as never before. With my reference solid-state headphone amp I can hear details that were previously buried in the complex instrumentation that Frank Zappa loved to employ. But now these details could not only be heard, but appreciated as never before. Musical instruments are inherently beautiful sounding, especially with a talented musician at the helm. Frank Zappa used the best musicians he could find for his band and with the microZOTL 2.0 one can luxuriate not only in the art and expertise of each musician and their instrument, but in the sound of their instruments. By now the readers of this review will probably be wondering which audiophile-approved properties of the microZOTL 2.0 excel and where it falls short. First of all, the bass of the microZOTL 2.0 is quite extended and pitch specific, and seems to reach as far as my reference Grado PS1000 will allow. But if I was to nitpick (and I usually do) I would have to point out that this bass is also a bit wooly around its edges. Personally, I like the sound of the microZOTL 2.0's bass. When I say slightly wooly I don't mean to imply that the bass sounds indistinct or like mush. It does not. It doesn't sound anything like the worst case stereotypical tube bass -- but it is not as tight as I'm used to. I sort of enjoy its smooth sounding bass; it somewhat subjectively raises its volume in the mix just a hair. And its bass is definitely more natural sounding than the super-tight, super-detailed stereotypical solid-state bass, that's for sure. The treble of the microZOTL 2.0 is surprisingly extended, with its very top treble slightly sweetened � sort of like how the treble sounds when it is coming from instruments in a live situation. If one is accustomed to hearing a live show with mic'ed instruments coming through a PA system one might complain that its treble is slightly rolled-off. I consider it to sound like music. One would expect that a tube headphone amplifier in the microZOTL 2.0's price range have a midrange with a high level of transparency, ease and clarity, so it's no surprise that this headphone amp has these qualities - no ifs, ands, or buts. Of course one would be quick to point out that the midrange frequencies of tube components are almost universally praised. But I'd also point out that the midrange of the microZOTL 2.0 doesn't sound as if it being reproduced by tubes or solid-state, it just sounds like it is being reproduced by a good headphone amp, period. Voices sound excellent � full bodied when called for, forward when called for, but always lifelike when the recording is up to it. Lastly, many complain that they don't like listening to music through headphones because it sounds as if the music "is coming from inside the skull", not as it does through speakers placed at the front of the room. This is where a good headphone amp will prove many skeptics wrong. Or at least somewhat wrong, since no headphone I've heard can replicate a speaker system's soundstage. But a headphone amp such as my reference OPPO HA-1 has the ability to have many of the sounds that come from the program material sound as if they originate way outside the confines of the headphone's drivers. This is not just a sonic parlor trick � when using a good set of headphones they are able to somehow create a "soundstage" that appears around one's head or around the drivers. This field of sound cannot in any way mimic the real thing, such as an orchestra, even if it was recorded in a realistic manner. But even if it is just a piece of percussion that sounds as if it is coming from across the room, the "outside the diver" sound aids in separating the instruments and groups of instruments of an ensemble. This also occurs with other types of music, such as rock and jazz recordings, where certain instruments and sounds seem to originate outside from beyond its earcups. This is just plain enjoyable to hear � and at the same time lessens the "inside the head" sound that occurs when listening to lesser headphones and headphone amps. The microZOTL 2.0 does not have the same proficiency as my reference in creating this illusion. It is certainly better at it than many headphone amps I've heard, some which are quite pricey. The microZOTL 2.0's slight lack of proficiency in this area certainly isn't a deal-breaker, as the microZOTL 2.0 has many fine qualities that still make it an excellent headphone amp, and one of the best tube headphone amps I've ever had the pleasure to audition. I apologize to any reader who might be looking for a headphone amp that can double as an integrated amp. I did not test this feature of the microZOTL 2.0, I just don't have any small, super-efficient speakers that can take advantage of its 1 watt per channel output -- although, those looking for a great headphone amp have come to the right place. The Linear Tube Audio microZOTL 2.0 amplifier might be just the ticket to tube headphone amplifier nirvana. I enjoyed every second this headphone amp was part of my headphone set-up. There is a good chance that I spend a great deal more time wearing over-the-ear headphones for serious listening sessions than the average audiophile, so those shopping for a headphone amp should take advantage of this fact and use my findings as a guide. Investing in the microZOTL 2.0 is hardly risky. I cannot imagine anyone feeling that they made the wrong decision after purchasing this excellent output transformer-less tube headphone amp. But forget for a moment that this headphone amplifier is powered by tubes and has no output transformer as part of its circuit. The Berning microZOTL 2.0 is an excellent headphone amplifier for one reason and one reason only � it sounds excellent. The fact that it can drive just about any headphone being sold today is a benefit, as well as the fact that it can be used as a "personal amplifier" for those that have a desktop system with speakers that are not self-powered. I give the Linear Tube Audio microZOTL 2.0 my highest recommendation.